In McKinney, Texas, and across the country, the lines between actual crime and typical adolescent behavior have been blurred to the point where police in many areas seem to recognize no difference whatsoever. Although the circumstances were different, what happened to Dajerria Becton in McKinney was quite similar to what happened to one of our clients – a 10-year-old African-American girl – this past March in Kenner, Louisiana. Part of the problem is that educators across America have adopted overly harsh “zero tolerance” policies and have invited police into schools to handle routine discipline. As a result, the lines between actual crime and typical adolescent behavior have been blurred to the point where police in many areas seem to recognize no difference whatsoever. In our work, we’ve represented many, many children across the Deep South who were marched out of school in handcuffs – often in front of their classmates – and thrown into jail cells, sometimes for days, for trivial offenses that aren’t even criminal. 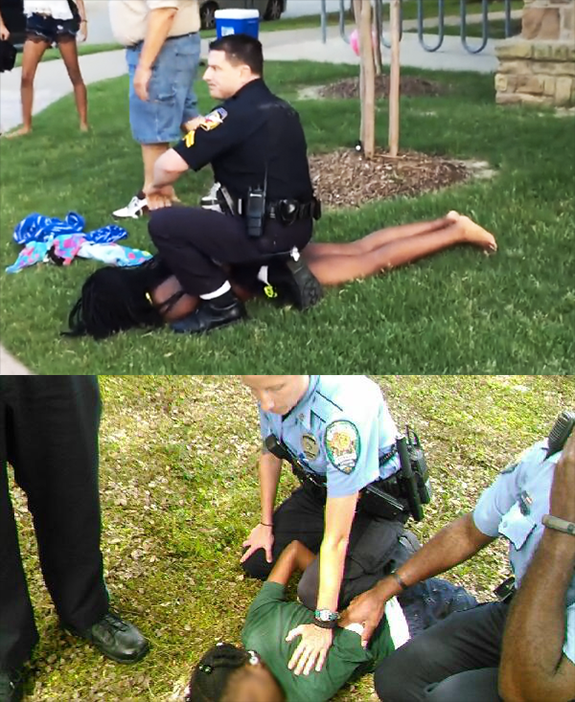 Top-- Dajerria Becton is restrained by a white police officer at a pool party in McKinney, Texas. Bottom-- A 10 year old student with autism in Jefferson Parrish, Louisiana is restrained by a police officer at school after having an outburst in class. This brand of “justice” for schoolchildren is anything but colorblind. Study after study show that black children are treated far more harshly than white kids. And the racial disparity has grown dramatically over the past four decades, a period that roughly coincides with the integration of public schools. Researcher Daniel Losen, director of the Center for Civil Rights Remedies at UCLA, has pointed out that in the 1972 school year, suspension rates at the secondary level were 6 percent for white children and 12 percent for African Americans. The most recent figures show a 7 percent rate for white children, almost unchanged in four decades. But for black children, the rate is now a staggering 24 percent. As for black girls, who comprise the fastest-growing segment of the juvenile justice population, some studies show they are suspended at up to six times the rate of white girls. These disparities also apply to children arrested in school. In Jefferson Parish, Louisiana, where the little girl with autism lives, African-American children make up about 42 percent of the student population in public schools. Yet, they were 80 percent of the nearly 600 students arrested in school during the 2013 year. Black girls were 23 percent of those arrested; white girls were just 6 percent. Monique Morris, co-founder of the National Black Women’s Justice Institute, told our Teaching Tolerance magazine recently that African-American girls in school are often held to rigid societal norms that don’t take account of possible cultural differences. In her research, Morris found that black girls often reported being reprimanded for being “loud” or “defiant” when they were simply trying to express themselves in ways that were natural for them. This dynamic may have been at work in McKinney. According to numerous reports, the incident at the suburban, neighborhood swimming pool began when two adult white women – apparently concerned that the pool was being overrun by rambunctious black children – began yelling at a teenage girl who had organized a pool party. They used racial slurs and one of them reportedly hit the girl. But when the police arrived, it was the black girls who were treated like criminals. In McKinney, as in Kenner, no apparent crime had been committed. So why were police so heavy-handed? It’s a question we, as a society, must answer – soon. We can’t continue criminalizing children simply for being children, especially when the sword of justice falls most heavily on those society gives so little margin for error to begin with.